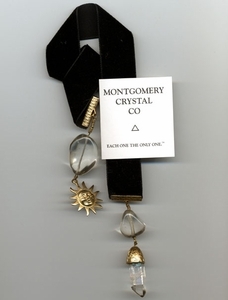 We've combined a super clear NINE-faced [extremely rare] rock crystal, rock crystal nuggets, and sumptuous black [washable] velvet for an Illuminator TM bookmarker that can focus your study. A fleabite to the main channel face is noted in our pricing. Overall 18 1/2", this luxury will not mar your books - and makes an accurate pendulum if you are so inclined.